My flight instructor scheduled the examiner for next Wednesday and I was on the final stretch. I arrived at the flight school for a phase check with a senior instructor. First thing I heard when I arrived was: There was a regulation change by the FAA. 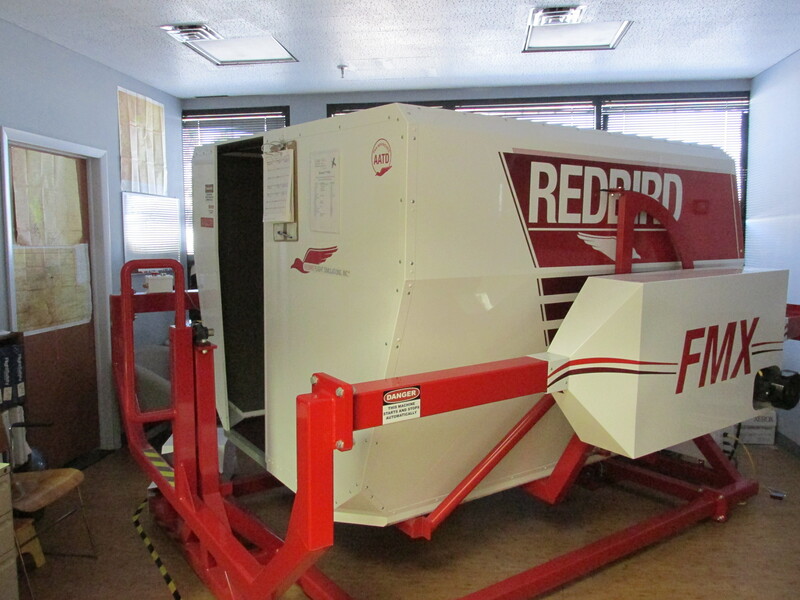 Aspen Flying Club, Redbird FMX. On December 3rd the FAA changed its requirements for the instrument rating. 20 hours of simulated instrument time, opposed to the former ten hours, were now counted towards the IR (a total of 40hrs is the minimum). They did not expect complaints but obviously not everybody liked the new rule. A few days ago the rules changed back to ten hours until further notice. I was one of the first to profit from the new rule and now I am paying more since I lack ten hours in the real airplane. I would have had my checkride with the minimum of 40 hours instrument time. The money spent would have been $7500. I keep track of all expenses in an Excel sheet, if anybody is interested, and I will probably publish it as soon as I hold the rating. Jon, the senior instructor, asked me if I wanted to postpone this flight. I decided to do the phase check as planned. Including two hours of oral, this day also meant practice towards the practical test. After writing some METARs and weather forecasts onto a whiteboard, Jon asked me: “Can we use Rocky Mountain as an alternate?” I looked through the Terminal Procedure Publication (TPP), saw the black triangle with the A in it along with the letters NA and said: “No, Rocky Mountain as an alternate is not available.” But NA actually meant Not Authorized, I learned the lesson and he asked me about minimum required equipment for IFR flight. Unlike in Europe these are rather basic. The acronym is GRABCARD, presumed that the VFR day and night equipment is installed. This 10001 foot runway is not to scale – thanks to MS Paint. When I arrived at the altimeter, I explained that it needed to be one with Kollsman-window and it must indicate within 75 feet of an elevation on the taxi diagram. I had the right thing in mind but didn’t say it right. The instrument must be set at a point of a known elevation. 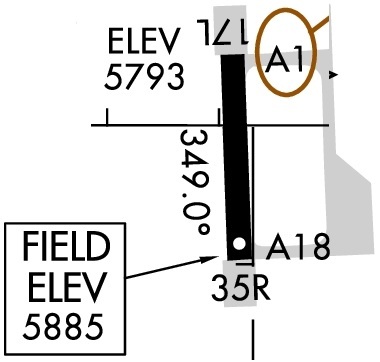 As you can see on this funny runway diagram, the threshold elevations are almost 100 feet apart. On an approach with a 200 foot minimum you better set your altimeter right. Jon just got warmed up and had the next questions ready. Minimum climb gradients; not a difficult chapter. You simply need to know how to translate feet per nautical mile into feet per minute. At least I believed it was simple. Jon wrote the local weather at Rocky Mountain Metro on the whiteboard. “Which minimums apply? What does the star mean?” An awkward moment of silence followed. I realized that the newest chart update included more restrictions than the old one. 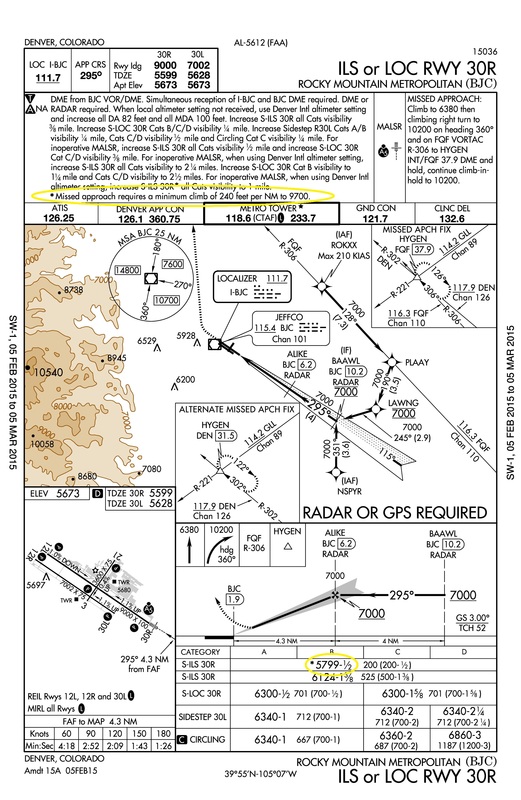 IFR charts are revised all 56 days. I finally found the note in the briefing section and it turned out Jon’s first question about the minimums wasn’t as easy to answer as expected. Instrument approach plates are full with important details. 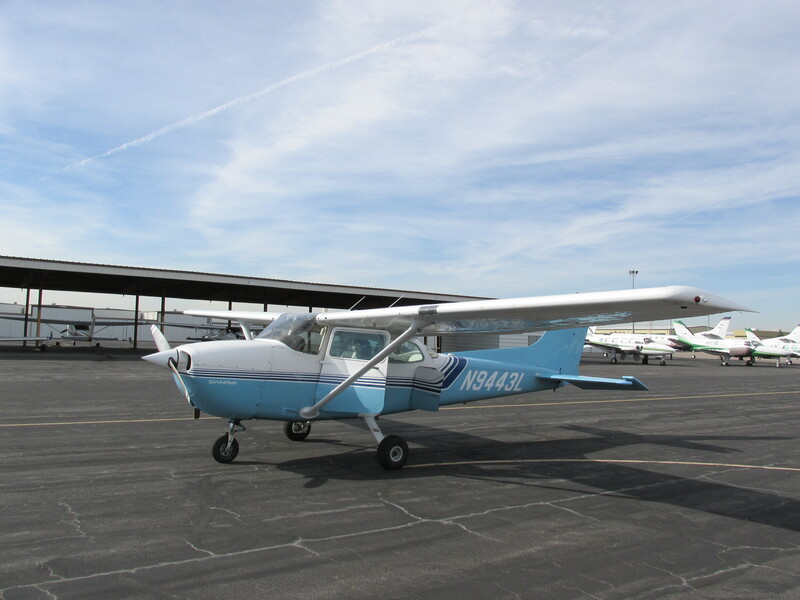 I had to find out if this Cessna 172P could sustain a minimum climb of 240 feet per nautical mile up to 9700ft. In order to do that I grabed the POH from the airplane. This Cessna had an STC for a 180hp engine, an upgrade of 20hp over the original one. Reading through the STC I couldn’t find any information on climb rates, so the only information I had was the original POH. According to that my climb rate would be 225 feet per minute at Vy, at this altitude 73 knots. Minus the headwind about 60 knots ground speed and since you travel one mile in a minute at this speed the number equals feet per nautical mile. From here on I could only guess. This numbers were for an airplane with 160hp at 2400lbs. The actual airplane has a gross weight of 2550lbs. My educated guess was that the climb rate would be similar. What does the FAA think of guessing after an accident happened? Probably not much. Jon explained that there was no way to proof on paper if the airplane could fly this missed approach and thus the higher minimum must apply. Fair enough, lesson learned. Irony probably wanted Mr. myclimbrate.com not to find his climb rate, right? We took off at Centennial and climbed towards the East, for an ILS approach at Front Range. As soon as I called up Denver Approach, I received Class Bravo clearance without asking for it. I was being vectored for the localizer and was soon established. Down to about 200 feet above decision height the localizer and glideslope were precisely crossed in the middle dot of the instrument. Then suddenly I was below glideslope and I corrected too harsh. I stayed within practical test standards but I wasn’t happy this had happened. I might have become complacent during the approach since it went so smoothly. For example the wind could have changed. A change in groundspeed always requires an adjustment in rate of descent. 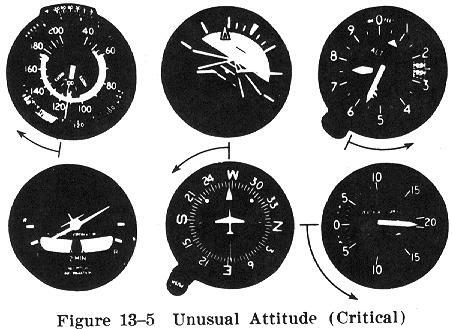 ILS approach and unusual attitude exercise during the missed approach. Just above decision height I took off my foggles and was right in front of the runway. “We’ll do unusual attitudes during the missed approach. Put your foggles on, close your eyes and keep your head down.” Jon took control of the airplane and I felt power adjustments, vertical Gs, lateral Gs. I had no idea in what attitude the airplane was. “You have control.”, announced the instructor and I had to react in the right order to steer the airplane back to straight and level flight. The exercise was surprisingly similar to the written exam where you simply see a picture, sometimes with a few failed instruments. The critical difference was the time to scan the instruments. In reality you might be exceeding a maximum structural airspeed, or you might have a clogged static port with an airspeed indicator acting as an altimeter. To understand what is happening and react – I hope I will never find out how difficult this might be in an actual event. Takeoff from runway 10 and GPS approach runway 28 at Centennial, KAPA. We headed back to Centennial for the GPS approach runway 28. It was a LPV approach, meaning a localizer performance with vertical guidance. The glideslope was centered and I started to descend. After a few seconds I realized the glideslope was centered because the signal had not been received yet – the instrument showed a red flag. Imagine that would have happened in IMC, it would have been scary. But that is what flight school is here for. Upon landing, Jon asked how I did. I explained what I didn’t like about the flight. Although he agreed, he pointed out that there was no such thing as a perfect flight. I liked that comment and felt how much I had learned during this phase check. The regulation change was unfortunate but I am now looking forward to learn even more.